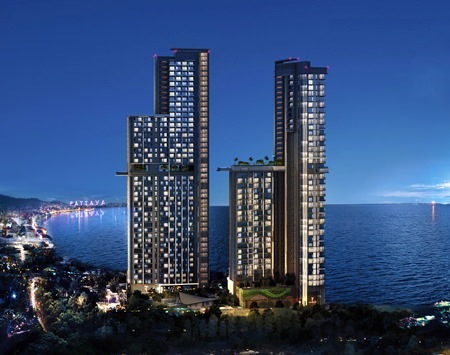 The Riviera Group recently announced that its luxury ‘The Riviera’ condominium project at Wongamat Beach has now been granted official EIA (Environment Impact Assessment) planning approval. With EIA permission now received, the Riviera Group is looking to start construction by mid July 2014, with a scheduled completion date in 36 months. 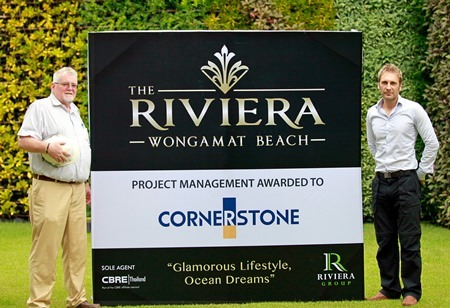 David English of Cornerstone (left) and project developer Winston Gale (right) pose for a photo after Cornerstone were appointed by Riviera Group to manage construction of the 3.5 billion baht development. 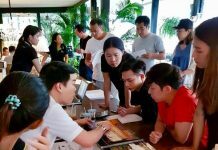 With the uniqueness of its luxurious showroom together with a 7-storey high viewing platform, The Riviera has sold almost 80% of the project’s units in only 8 months since launching. 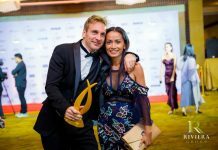 For more information, go to: www.therivierapattaya.com. ‘The Riviera’ has now received full EIA approval and construction work is expected to commence this month.